Rory McIlroy eagles the eighth in round two. Rory McIlroy put his foot on the gas as Chinese teenager Tianlang Guan became the first player to be handed a slow play penalty in the Masters. While Graeme McDowell and Padraig Harrington missed the cut, McIlroy battled back from two bogeys in his first three holes to card a super 70 that left him right in the hunt, four strokes behind leader Jason Day on two under par. 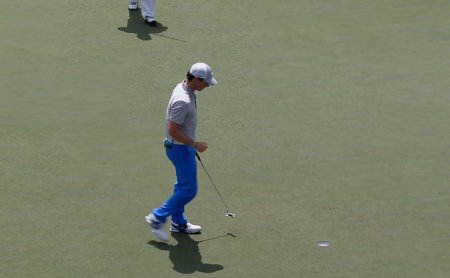 “The big thing that worked for me today was discipline,” said McIlroy who three-putted the first and then bogeyed the third before playing his last 15 holes in four under par. “You had to be very disciplined, not go for pins at times, know that par was a good score and I knew that if I did that and took my opportunities as they came along, anything under par would be good. As 14-year old Guan was penalised a shot at the 17th for persistent slow play and signed for a 75 that left saw him eventually make the cut on the four over limit, McIlroy was happy to reflect on a fighting performance that was kick-started by some clutch putting and an eagle just before the turn. After hole four par putts in a row outside six feet from the fourth, he got his green jacket bid up and running when he eagled the eighth with a 275-yard three-wood to three feet. It came off the mounds on the left and ran up to three feet at the eighth and made eagle to get back to level par for the tournament. After birdies at the accessible 13th and 14th, McIlroy bogeyed the 16th but holed a crucial 18 footer for par at the 17th before draining a 10 footer for birdie at the last that left him just three shots adrift of 53-year old clubhouse leader Fred Couples (71). Rathmore’s Alan Dunbar added a 77 to his opening 83 to finish on 16 over in his last event as an amateur. McIlroy loads up on the eighth on FridayThe 22 year old will make his professional debut in the Challenge de Madrid in a fortnight and is expected to get his first invitation on the European Tour at the Nordea Masters in Stockholm at the end of the month. The reigning British Amateur champion was 10 over after eight holes on Thursday but improved by nine shots on that start yesterday with his only blemish over the same stretch coming with a three-putt bogey at the seventh. It was his only three-putt of the day in a 32-putt round and while then dropped five shots in eight holes from the ninth, he was not too downcast. Former Masters champion Trevor Immelman, who played with Dunbar for the first two rounds, advised the Ulsterman to practice hard in the professional ranks. “I really felt for Alan yesterday because he had a really brutal start and you don’t want to wish that on anybody,” the South African said. “You could see he looked uncomfortable and not very happy but all credit to him as he played the back nine yesterday very solid, and he played a little better today. “But he just seemed to be really struggling with the snap hook and that’s not ideal. McDowell missed the cut by a shot in the end carding a 76 to finish a shot outside the mark on five over. “I carried out the game plan pretty decently but there are a lot of tee shots on this golf course that really don’t set up for me. “The missing dynamic in my game is off the tee around here. I don’t have the 300 yard draw and for me to compete around here without that I have to putt very well and I didn’t do that. Harrington had too much to do after his opening 78 and a 75 left him five shots outside the cut line on nine over. “They were tough pins and it was a tough day to try and make some birdies and the damage was done the day before,” Harrington said. One was devastated and looking for time off to mend his shattered confidence and recover his love for the game. The other was simply marking a disappointing Masters performance down to experience and wishing he had another tournament to play next week. KIAWAH ISLAND, SC- AUGUST 11: Rory McIlroy of Ireland smiles with the media during his press conference after play was delayed for the third round of the 94th PGA Championship at The Ocean Course at Kiawah Island Resort on August, 11, 2012 in Kiawah Island, South Carolina. (Photo by Montana Pritchard/The PGA of America) Tied for the lead with the hardest worker in golf in Vijay Singh, Rory McIlroy will resume his weather-delayed third round in the US PGA with the world’s hungriest Australian and a host of major winners breathing down his neck. Tianlang Guan celebrates after holing an 80 footer for par at the last.Graeme McDowell might believe that handing Chinese teenager Tianlang Guan a slow play penalty sent “the wrong message out to the world” but for Padraig Harrington the incident was merely a cruel introduction to the harsh realities of professional golf for the 14-year old sensation.